After years of singing in bands, Pat decided he needed a new challenge and entered and won a Talent Show at the Plaza Ballroom Glasgow in front of a sell-out audience. It was suggested to him by a friend that his voice was perfectly suited to singing songs by Kenny Rodgers and Neil Diamond. He asked that Pat included The Gambler by Kenny Rogers and America by Neil Diamond. Pat entered the TV talent show “Stars In Their Eyes” as Neil Diamond but the show already had a Neil Diamond so Pat auditioned for Kenny Rogers. Mathew Kelly the shows host introduced him with ’TONIGHT, LADIES and GENTLEMEN – PAT CAIRNS IS KENNY ROGERS’’ Pat won and reached the Grand Final of Britain’s top TV talent Show. The only Kenny Rodgers tribute act to ever achieve that. 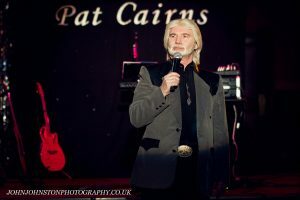 Since then Pat has been touring the U.K and abroad with his Tribute Shows to Kenny and Neil Pat is an incredible singer and guitarist and one of the most popular tribute acts working today. He sells out clubs and venues all over the country and is always booked back. Pat comes totally self- contained with a fabulous sound system and light show.